This dotted cream pencil skirt is a wardrobe favorite and if you’ve been around awhile you probably recognize it. Mixed with a graphic t-shirt and denim jacket, it’s one of my favorite go-to looks, and I like that the white on white makes it feel a bit new this Spring (I’m all about finding ways to re-work your closet staples!). 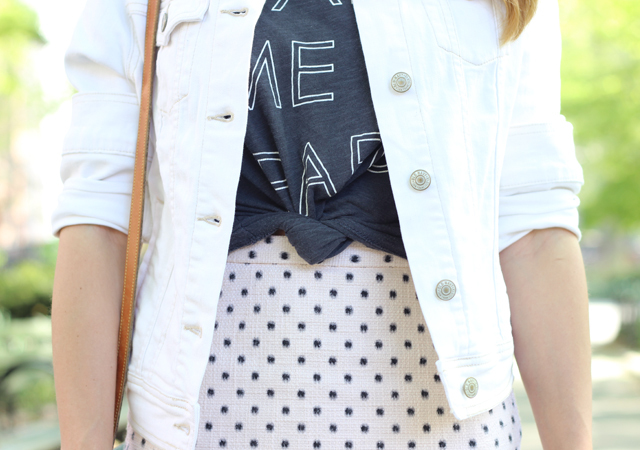 A darker t-shirt underneath picks up the skirt’s dots and stripes on the shoes and makes it feel a little less stark. Orange-y red lips, a vintage bag and oversized shades and my usual ‘what to wear’ on a Monday morning felt like a breeze. p.s. Happy Cinco de Mayo! Not that I need an excuse to enjoy an extra large margarita.. olé!